​"The Unintended Consequences of Technology" will take place on January 17 at 7pm. On top of exciting array of AI experts and a fabulous musician, there will be a carefully conceived and delicious four-course meal. We thought you might want to know what's cooking... and why! Food insecurity and undernutrition are the most serious and common manifestations of protracted crises, which disrupt both livelihoods and food systems. Although each protracted crisis is different, underlying causes include some combination of conflict, occupation, terrorism, man-made and natural disasters, natural resource pressures, climate change, inequalities, prevalence of poverty, and governance factors. In a future world with a projected population of 9.7 billion people by 2050 and 11 billion people by 2100, proactive food security is one of the greatest challenges to our ingenuity, creativity, and adaptability. The Committee on World Food Security (CFS) reports to the UN General Assembly. It consists of members of the UN Food and Agriculture Organization (FAO), the World Food Program (WFP), and the International Fund for Agricultural Development (IFAD), in conjunction with civil society (e.g., small-holder farms and fisheries), NGOs, and philanthropic foundations. The mission of CFS is to identify and resolve the challenges to global food security. To this objective, CFS has identified a framework of 11 Principles for action. ​Our meal tonight has been conceived to promote and highlight Principle 10(33): Mitigate the effects of natural and man-made disasters, adapt to climate change, and promote sustainable use of natural resources. There are several approaches we wish to examine: expanded use of existing space through hydroponic technology (greenhouses, vertical farming, drip agriculture), enhanced traditional husbandry, and biotech/genetically modified initiatives. Your starter salads were grown right here in NYC, in high tech greenhouses in Brooklyn and Queens. Gotham Greens operates nearly 170,000 square feet of greenhouses that provide year-round local, organic, pesticide-free produce to customers in New York and Chicago. Interestingly, a warming ocean results in benefits to some species, including cephalopods. Your calamari is wild-caught, and this is not only sustainable but will likely become a seafood staple for both diners and the commercial fishing industry. Your Oaxacan Mole Chili is more exotic, combining sustainable fair-trade cacao; mass-agriculture beans; ultra-pasturized tomatoes and peppers; and Quorn, a vegan myco (mushroom) protein that provides more fiber, minerals, and protein per gram than meat. Quorn has also been proven to lower LDL (heart attack) and glycemic (diabetes) risk. The dates used in your dessert are produced in Israel using advanced breeding, water-restrictive selection techniques and drip irrigation. Cross-posted from the Union for Reform Judaism Blog. ​I gravitate toward cookbooks – of any kind, really. I think though, that there is something very Jewish about the way I use cookbooks, and the way I use Jewish cookbooks, in particular. First, I love exploring the history and geography of food through cookbooks. I contemplate insights they offer into the origins and uses of foods, and what can be gleaned about the individuals behind the recipes. Second, I use recipes to spark creativity and invention. If imitation is a sincere form of flattery, taking a recipe and arguing with it, bringing new sources into the mix, and coming up with a bold new creation is true Talmudic love. These tendencies are exacerbated while talking about the cookbooks of the Jewish people. I love dreaming about the lives and foods of Jews around the world and debating about why those exact seven vegetables must go over the couscous, or whether the chicken in a pomegranate walnut sauce could instead be replaced by a butternut squash. These debates are fierce and never-ending. I recently visited a dear friend’s summer house in the Berkshires, and I happened upon a cookbook he had (which quickly changed hands) called Jewish Cookery from Boston to Baghdad. As my husband Brian and I perused it, we gravitated toward a recipe for Libyan eggplant fritters stuffed with mushrooms and cheese. I find this quite poetic. Manna, the substance God provided for the Israelites while they wandered the desert, supposedly tastes differently to different people, according to the Talmud. It also signifies finding something miraculous. For instance, the phrase “like manna from Heaven” might be deployed when a person unexpectedly spies a fantastic Jewish cookbook in a summer house. I think the idea of manna sandwiches made of eggplant accomplishes something similar: transcending the ordinary into the sublime through food. Food is about more than sustenance; it is about expressing oneself, one’s values and identities, and is best when eaten in community. ​My husband and I are the cooks for FED, a community where you are fed delicious food, inspirational ideas, and the company and creative energy of others. We prepared the manna sandwich recipe for this year’s Yom Kippur break-fast, with wonderful results. The eggplant is crunchy, and the cheese and mushrooms inside are pure umami. Try it for yourself! Peel and cut eggplant into slices less than 1/2 inch thick. Cut each slice into rectangles about 1-1/2 by 2 inches. Place in a colander and sprinkle with salt. Let stand for about 30 minutes. Sautee onion in olive oil until transparent. Add mushrooms and sage and sautee lightly. Cool. Add cream cheese, parmesan and a pinch of salt. Blend well. Add egg yolk. Mix. Rinse eggplant pieces and pat dry with paper towels. Dredge in flour. Fry lightly in oil until soft and just golden but retaining their shape. Spread half the eggplant pieces with the cheese mixture. Cover with another piece to make a sandwich. Beat remaining eggs and dip each sandwich into egg and then into seasoned breadcrumbs, completely covering. Fry in deep, hot oil for about 3 minutes or until crisp but not too brown. Drain on paper towels. Serve immediately. 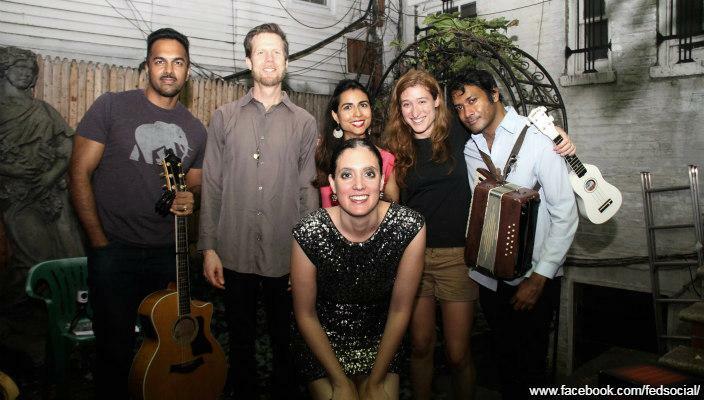 ​If you find yourself in New York City, come celebrate joyous occasions at FED! View upcoming events. It is my pleasure to present you with... Rosh Hashanah Menus! Just in time for High Holidays 2018 - see our full offerings for Rosh Hashanah and Yom Kippur here. Brian and I think long and hard about menus. For Rosh Hashanah, there is a rich tradition to work with of simanim, culinary omens for a sweet and successful new year. Many of them involve plays on words in Hebrew or Aramaic - that ensure that our enemies will get cut off (yikartu - a pun on karti, leeks) or that we be fruitful and multiply (like fish). Look for the following simanim reflected in these menus: apples, dates, fish, leeks, squash, carrots, beets, and black-eyed peas. The meals are pescatarian, and we can accommodate dietary needs upon request, including vegan, dairy-free, gluten-free, etc. Please join us for one or both meals at FED House. 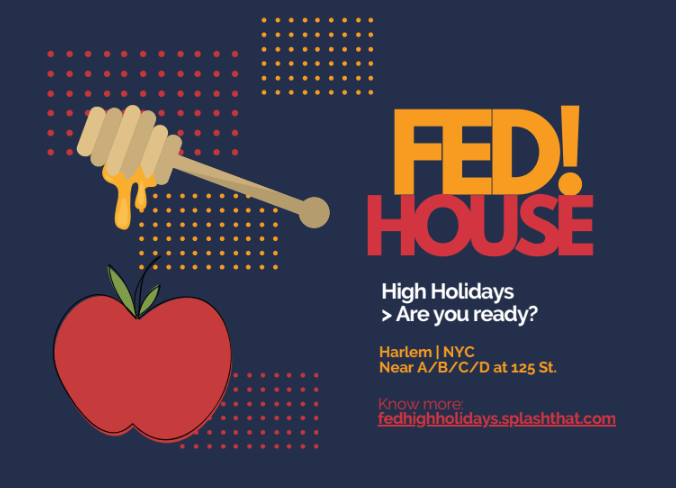 FED - an intentional community based in Harlem, NYC - feeds you with delicious food, inspirational art and ideas, and the creative energy of others you find here. For the first time, this year FED will be offering services and meals for the Jewish High Holidays, Rosh Hashanah and Yom Kippur. There is a universal need for spiritual experiences, for a sense of community and belonging. FED offers a platform for creativity and dialogue where those from a variety of backgrounds feel welcome and included. It so happens that creativity with the tradition and how it can inspire reflection, help us find and realize a sense of purpose, and be our best selves is to me what Judaism - and FED - is all about. We continue the next day at 4pm with Ne'ila, as the Book of Life is being sealed for the year. Dario Helman will lead us in an immersive experience called "Therapeutic Chevruta (study in pairs)," weaving together the personal introspection of psychoanalysis with the collectivism of religion for some deep conversations in a trusted environment. Opera singer and Jewish innovator Marques Hollie will perform from the rich holiday liturgy. All this hard work is then rewarded with a Break Fast, a delicious communal meal. Please join us! What do the High Holidays mean to you? I think of the little things, like stiff new dresses for synagogue, playing with my father's prayer shawl, and honey attracting bees in a sukkah (outdoor hut erected for the holiday Sukkot). In my memories from childhood, I marvel in life's small and seemingly mysterious details. Now as an adult, I wonder how that sense of newness could be restored - and with it an appreciation of being part of a larger whole, of our tiny place in the universe's vast cosmos, and of awe at the world and of its Creator. We are all human, and everyone falls into a rut. That's why the High Holidays exist in the first place: to ​sing above the noise of our lives, to awaken us with the call of the shofar (ram's horn) to our original purpose as sons, mothers, lovers, citizens - as human beings. I want to do something new this year for the High Holidays. I want to offer services that are interactive and meaningful, and that provide entry into the enormity of the High Holiday liturgy - both for those who have fond memories like mine, those who are looking for something fresh and new, and for anyone seeking a Jewish service that is accessible, without regard to background or experience. Over the course of Rosh Hashanah, a big celebration of the New Year, FED will be hosting three services led by Hadar Cohen and two dinners. For Yom Kippur, the Day of Atonement, we will offer Kol Nidre, perhaps the most dramatic, significant and powerful service in the Jewish calendar. In a participatory music theatre take on the Jewish ritual, Mátti Kovler and members of Floating Tower will explore the parallels between different versions of Kol Nidre (from the Persian, Yemenite and Turkish traditions) and other magical incantations. The next day, as the Book of Life is being sealed for the year, an immersive experience called "Therapeutic Chevruta (study in pairs)" led by Dario Helman will weave together the personal introspection of psychoanalysis with the collectivism of religion for some deep conversations in a trusted environment, and opera singer Marques Hollie will perform from the rich liturgy. This all will lead into the breaking of the day-long Yom Kippur fast once the holiday ends at sundown. Cracking the holiday service has been my dream ever since starting FED three years ago. We have been working up to it. 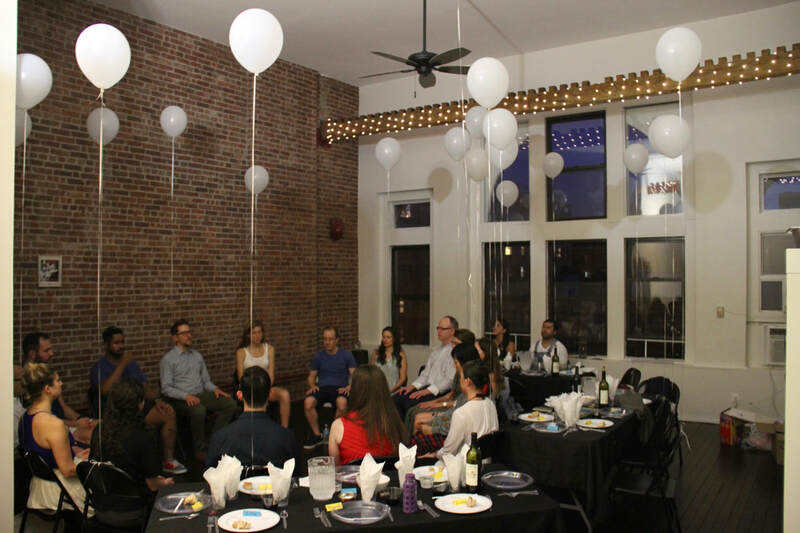 Last year's Rosh Hashanah event featured a meditation session on the past year and a modern dancer performing an interpretive piece on making mistakes, regretting them, and how to move forward; we wrote our dreams for the new year on balloons that flew high around the room (see below). There is a universal need for spiritual experiences, for a sense of community and belonging - all year round, and especially on the High Holidays. It goes back to the reason I founded FED: New York City is teeming with extraordinary people, yet it can feel isolating, lonely and impersonal. Furthermore, in today's polarized discourse, too often we find groups speaking only amongst those with whom they agree. I envision an ideal Jewish community, powered by the Jewish values of hospitality, openness and dialogue, that can ameliorate these challenges. In order to do this, as an entrepreneur and chef, food is my personal artistic expression and also my convening tool: it lowers social barriers to entry and fosters connection (not to mention that at FED it is vegetable-forward, home-cooked, and delicious!). The coming High Holidays will be a special mix of these FED ingredients that make a greater whole: a platform for Jewish creativity where those from a variety of backgrounds feel welcome and included. Indeed, creativity with the tradition and how it can inspire reflection, help us find and realize a sense of purpose, and be our best selves is to me what Judaism (and FED) is all about. There are two final ingredients without which FED would not be possible. The first is the rich collaboration with artists, facilitators, speakers, and other sorts of rockstars who bring their energy and their full selves to the party. For the High Holidays, we have Hadar Cohen, a spiritual leader and community organizer manifesting visions of feminism, soulful prayer, and communal care, who will lead us for Rosh Hashanah. Composer Matti Kovler, the founder of Floating Tower, together with singer Parham Haghighi and Laura Derover on electronics will produce the Kol Nidre musical theater. Opera singer and Jewish innovator Marques Hollie will perform and Dario Helman, an analyst of modern psychology and religious practice as systems of transformation, will bring us the unique workshop as Yom Kippur closes that will take us through "Therapeutic Chevruta". The most special ingredient to FED is also the most simple and priceless: love, home, and all those visceral feelings that go back to the childhood vignettes I described at the beginning. I co-create FED together with my husband Brian Shelby in our home, a former firehouse converted to loft apartments in Harlem. This is our home, and we want it to be yours, too! If this vision for Judaism, the High Holidays, creativity, and community speaks to you, please come connect! I hope to host you soon, and in the meantime, wishing you and yours a Shana Tova, a sweet and beautiful new year. For more information about High Holidays at FED and how YOU can join us: https://fedhighholidays.splashthat.com. See you at FED! Allow me to tell you a secret: I have great admiration for those of you who have savvy in getting folks to be better together than they would be by themselves. You are combating apathy, disconnection, and disaffiliation in today's America. You are asking the right questions about the meaning of being together in this time and place -- and answering them through fantastically creative avenues and programs. If you feel that being a pioneer and a shepherd all rolled up in one can sometimes be exhausting, or challenging, here’s something to cheer you up: You are not alone, and I have a recipe that will feed us all ;-). Four years ago, I set out on a journey to interview about 30 Jewish community builders to learn what we all had in common and what our challenges were. They all had a desire to get to know others due to an insatiable curiosity for and fundamental love of people; a knack for retaining knowledge about others so as to formulate helpful connections between disparate parties on the spot; and an ability to employ these talents for the sake of driving forward projects, and ultimately missions. Sound familiar? But more than that, the vision that came out of those interviews was that there was a need for a network of “network-weavers” (don’t worry, they didn’t call themselves that, either). Since then, I founded a community that restores our human capacity for empathy through delicious food, inspirational ideas, artistic performances, and dialogue with people from diverse backgrounds who engage with Jewish creativity and culture. I called it FED: it’s like TED, but you get fed. As Victor Hugo (the French guy*) said: nothing is more compelling than an idea whose time has come. So tell me what you think of this menu. Hand-picked invitees, chosen for their brilliant minds and community-building efforts, with a bent towards community engagement and the arts. Get them together, with their passions and experiences. Put them in a Harlem Loft. Have a French facilitator* pose meaningful questions to feed their souls (he didn’t know how to cook), and a New Yorker chef (yeah NYC!) to feed their stomachs with delicious food. Bake for a few hours. Create a first and one-of-a-kind woven meeting. Explore the feasibility of all of us doing complementary work. Allow us to achieve more together than we could alone. Lay the foundation of an up-and-coming Professional Field. Yield: One Batch of Widening Your Vision for Creativity, Connection, and Action. *About that French facilitator: The conversation will be facilitated by Ruben Uzan, who has expertise in the influence industry of advertising; the authority industry of politics; and in the reshaping industry, where he facilitates collective identity-building for self-organized communities, nonprofits and the private sector with brand-storming workshops. Let me know if you are interested in participating, and/or what thoughts you have about this idea. We hope to find a date in early December. Also, if you have colleagues or know others who you think should be part of the conversation, I would welcome the opportunity to connect with them. Cross-posted from the Union for Reform Judaism (URJ) blog here. If it’s time for inner reflection, it must be… the High Holidays! As an entrepreneur, I find the practice meaningful as part of the iterative cycle of innovation and reflecting on results, which leads to further innovation. As a network-weaver and community-builder, I find it meaningful to consider not only what would move the dial for each of us individually, but what has the power to transform our community. I’ve spent two years running FED, which brings New Yorkers together for dinner parties full of gourmet food, inspirational ideas, and the company and creative energy of dinner companions; I also have 10 years prior experience of active hosting and creative community-organizing in the Jewish community. As I reflect on all of it, I share some ideas to spark thought and conversation about Jewish engagement. I believe that the foremost challenge – and opportunity – facing the Jewish community in America today is how to embody inclusivity, openness, and diversity from a position of strength within the Jewish tradition. At the very moment when Abraham’s tent went into business, welcoming all wayfarers by being open on all its sides, these values not only became embedded into our heritage, but also became our imperative for action. The truth is, Abraham was onto something. Network theory shows that innovation comes not from within the most highly connected center of a group of people who talk to each other all the time, but rather from its periphery – from the people whose thinking you are not exposed to every day. Technology presents us with unprecedented chances to connect with people vastly different from us around the globe and all the time. Yet how often do we embrace those opportunities? Or do we become siloed in an echo chamber only with those who agree with us? It’s easy to talk about diversity, but pulling it off can be elusive. I offer reflections about what has worked for me – and might work for you! 1. Be welcoming of everyone – not just Jews. When I talk about my ideal Jewish community, I don’t mean a community just for Jews. The reality of today’s world is that our communities are and need to be interwoven in order to be strong, compassionate, and thriving. 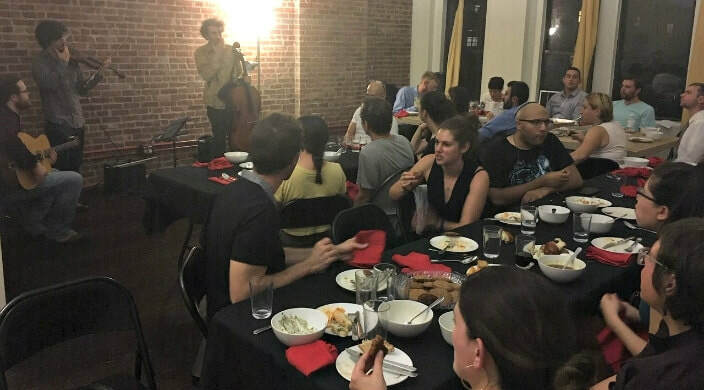 What sets FED apart from other meal-based Jewish engagement programs is that its network of attendees is curated to host artists, entrepreneurs, professionals, and other awesome people who want to be fed – period. This feels different than targeting a Jewish audience, however welcoming you may be toward others who also join. 2. Get to know your guests in a real way. Invite them to not only experience your traditions but also to show you theirs. For instance, I’m hosting a Muslim-Jewish Interfeast in partnership with the Muslim-Jewish Solidarity Committee for expressly this purpose. 3. Manifest the Jewish spirit in ways that are creative, meaningful, and unleash the potential of Judaism. Many FED events are held on Shabbat and Jewish holidays and offer such creative experiences as a jazz violinist performing Avinu Malkeinu for Rosh HaShanah, an immersive homespun spiel for Purim, or salon-style Shabbat with exhibitions ranging from stew-making demonstrations to comedians to musical performances. Make it musical, make it spiritual, make it dramatic. Judaism is a platform for creativity and realizing our potential both as individuals and collectively. We can make it happen! 4. Offer quality in-person experiences. People are tired of the narcissism and polarization of digital communications. FED is successful because it feeds into contemporary trends, such as the rise of the dinner party and social clubs, which afford opportunities to be present and connect in a real way with those around us. At FED, you have uncommon conversations with those from different backgrounds that wouldn’t necessarily have occurred otherwise, as your most authentic self. This is made possible through the act of breaking bread together, which, when combined with inspirational ideas, becomes the fodder for deep dinnertime conversations. Food is a unifying force. And here’s one more tip: Good food works even better! I invite you to try these tips around your Rosh HaShanah table this year – and in the spirit of inclusivity, if you’re in New York City, I also invite you to join my holiday table at these upcoming FED dinners, which include a Rosh HaShanah dinner hosted at East End Temple and a Shabbat dinner with a creative Tashlich meditation. Shanah tovah! Deborah Fishman is the founder of FED—like TED, but you get fed. FED offers dinner parties where attendees are fed by delicious food, inspirational ideas, and the creative energy of their dining companions. This Sunday the 12th at 6:30pm! This Sunday, Joshua Spodek will once again take the FED stage for the launch of his book, Leadership Step by Step: Becoming the Person Others Follow. Best of all, if you attend, you will receive a copy of the book! Joshua will facilitate for us one of the most popular exercises from the book, on creating a meaningful connection. (I couldn't think of any meat-centric desserts, so I decided upon a different transformation: Vegetable -> Cake! ​Joshua Spodek (left) is a Columbia Business School MBA and NYU Adjunct Professor of leadership who delivered a FED talk on Entrepreneurship last year. Read some critical acclaim for Leadership Step by Step here! Saturday, January 28th at 7pm. RSVP here! ...and it's California Beach themed! Friday, December 9 at 6:30pm. RSVP here! Ever wonder what happens behind the scenes when FED comes about? Here's the step-by-step that has led me to new experiences, friendships, and adventures! 1. Make new friends. Sometimes, all it takes is meeting new people for entire new worlds to open up. The dinner came about because I had the pleasure of meeting Monica Huayna Chirinos, who is Peruvian, through my dear friend Aimee Weiss. 2. But keep the old. As the song would have it, friends like Aimee are solid gold. Aimee and I are more than friends -- we're cooking buddies. When Aimee traveled in Peru, she kept a list of Peruvian delicacies, knowing that at some point we would recreate them. With Monica on board to lend her Peruvian know-how, the time is now! 3. Break out of your bubble. I feel so fortunate to live in New York City, where if you're not having eye-opening cultural exchanges, it's your own fault, for they are always just around the corner -- or at least in the next borough. Brian and I went to Jackson Heights, Queens to shop at Mi Tierra, a grocery store featuring an overwhelming variety of Mexican, Central and South American products (yes, this is what we do for fun). We had an intense experience in the Peruvian aisle, where we were assaulted by not just one, but at least five different brands of achiote paste, a brightly colored condiment made from red annatto seeds. We also found chicha, a beverage derived from maize; cancha, a popular snack akin to popcorn made from a variety of corn called maiz chulpe; and, critical to the production of Peruvian food: aji amarillo, a brilliantly yellow chili pepper native to the Andes. Oh, and a little dulce de leche never hurts. Inspired to try some Peruvian food? Here is the full menu to further excite you! Space is limited -- RSVP Today!